My time in Vegas was…interesting. I choose to call it “interesting” due to the fact that we had as many bad experiences with rude locals and pushy tourists as we did good with sightseeing and casinos. So, “interesting” will be my term of neutrality for this post. Don’t get me wrong, we did have a good time, but there were incidents and people who made certain aspects of our trip unpleasant. I generally don’t mind tourists, or locals, for that matter. In fact, when I was living in Washington, DC, I was always happy to give tourists the directions to popular monuments and museums, and instruct them on how to use the Metro system. Whenever I visit a new place, I seek out the wisdom of local residents, as they have inside knowledge on the best sights and eats. I consider myself to be a good tourist, often making a new friend or several among my fellow visitors. Why this blew up in my face in Vegas is beyond me. I was pushed, shoved, stepped on, glared and yelled at on each of the four days I was there. I honestly didn’t understand the open hostility, and still don’t, but I didn’t allow it to ruin the mood of the trip. I think the current state of our economy has people a little pressed, and understandably, less friendly than they would ordinarily be. Despite this unpleasantness, we still had a great time. My grandmother and I, escape artists that we are, planned this trip a week and a half in advance. We literally booked take this trip at the last minute, after deciding that we needed to get away for a few days. That lack of planning didn’t leave us with much money to play with, but as it turns out, you don’t need a ton of money to have a good time in Vegas. It probably gives you a better experience, but again, there are budget-friendly activities and restaurants that will satisfy even the most frugal traveler. To stay on budget, we opted to eat at inexpensive restaurants and the hotel buffet so that we could hit more casinos and tourist spots. I adored the local eateries we did visit, such as Rock and Rita’s. I highly recommend that place to anyone interested in inexpensive dining and entertainment. Go for the party atmosphere and spirited karaoke contests if not for the food, because that place is hopping at night. The bartenders, most of whom are imports from all over the globe, put on fantastic shows (and make mean cocktails!) as they mix and pour drinks for patrons. Some even take part in the karaoke festivities, making the experience even more fun. For those who are really cash-conscious, Del Taco, Denny’s, Chipotle, and In N Out are inexpensive, satisfying options that give you a bit of freedom for other activities. It definitely made our Las Vegas more enjoyable. The majority of our time – and money – went to visiting hot spots along the strip. I would have preferred to take a bus tour of the city, a helicopter tour of the Grand Canyon, and a drive to Hoover Dam, but as we were limited in both time and money, opted for more reasonable locales. These are things I fully intend to do the next time I’m in Vegas. Simply flying over the Grand Canyon was inspiring and somewhat spiritual, but the lack of a proper camera (I currently use my BlackBerry) definitely put a damper on things. Our first stop was the Secret Garden and Dolphin Habitat at the Mirage. Made famous by Siegfried and Roy, this little alcove of the Mirage Hotel and Casino was a fun way to kick off our stay. 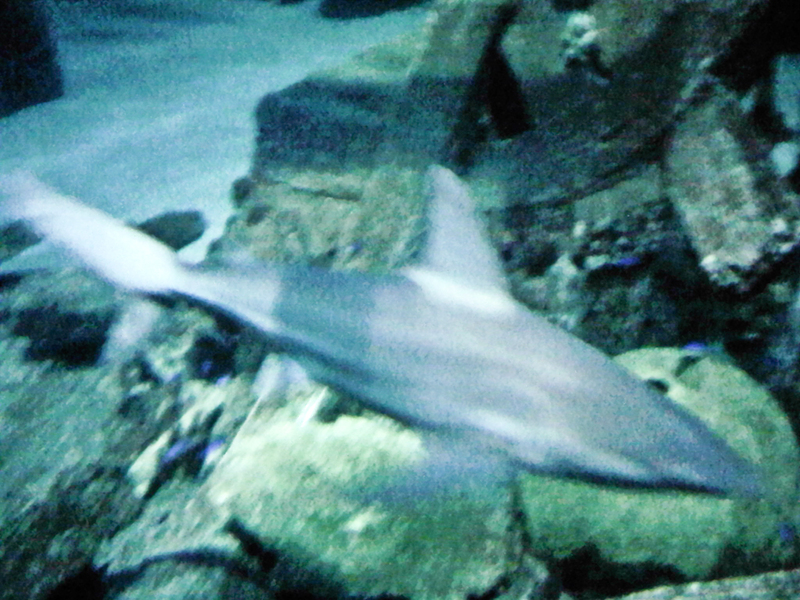 We started off in the dolphin habitats, watching them swim around and pose for the cameras. 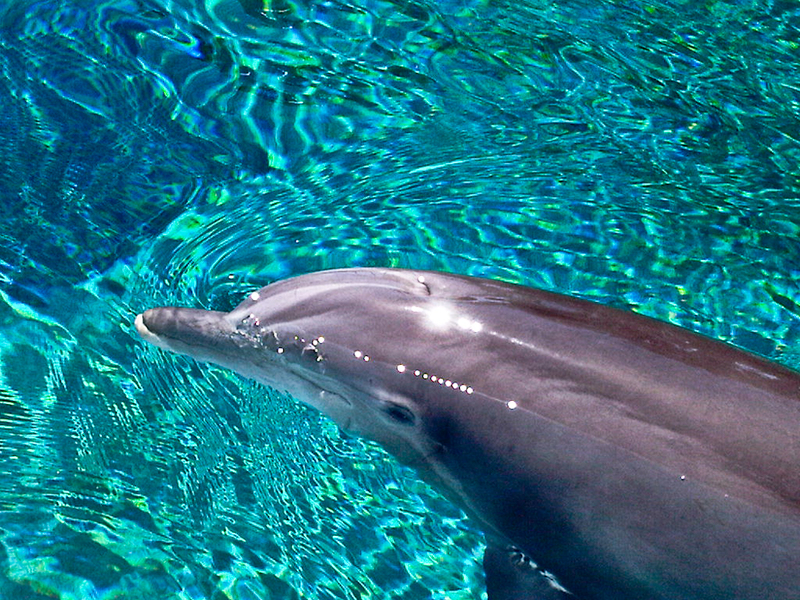 Yes, dolphins know to pose for cameras, which was quite a surprise. I guess they’re just used to it. 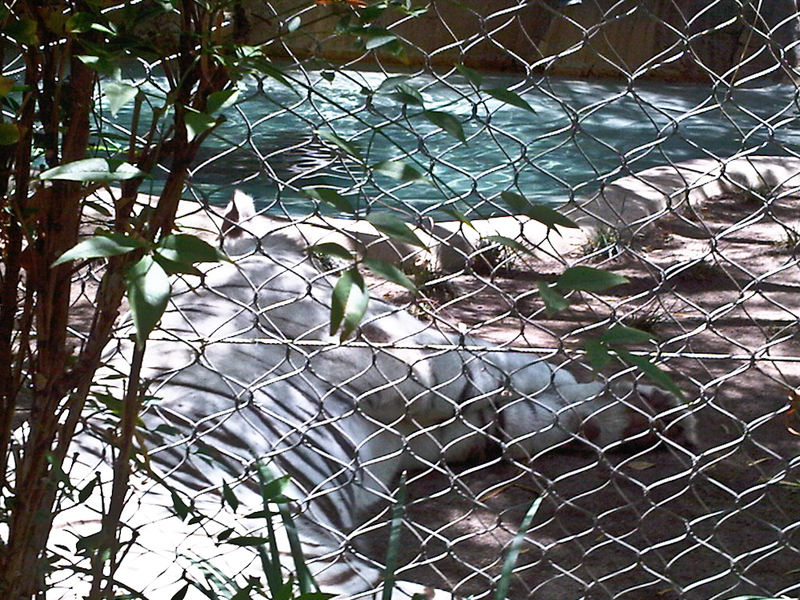 We spent a good hour in the dolphin habitats, and then moved on to the big cats. 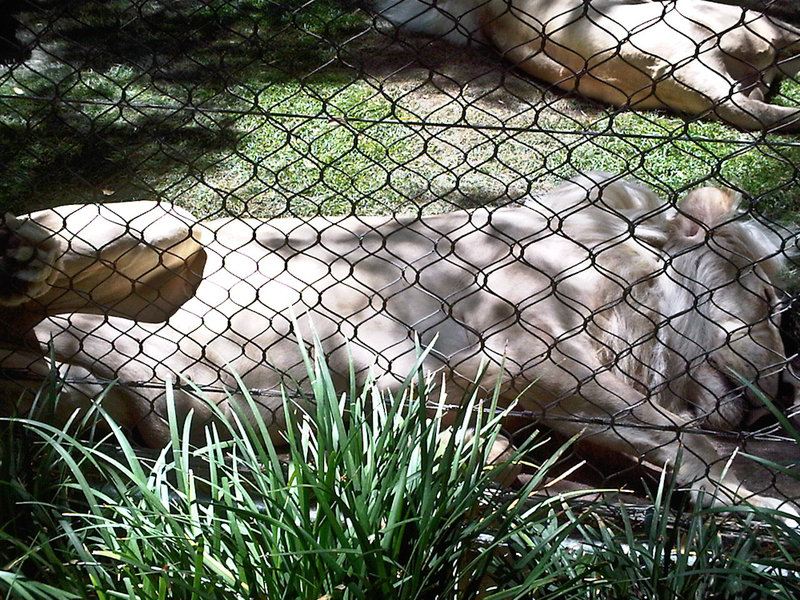 Remember that photo I posted of the white lion a week ago? 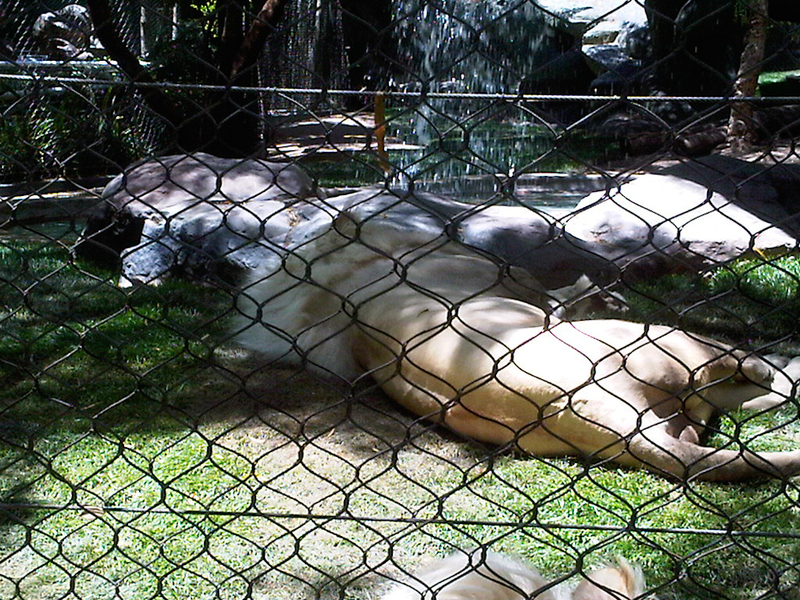 Either they no longer have “white” lions, or these guys are in serious need of a bath. They were beautiful to look at, despite being a little…dirty. 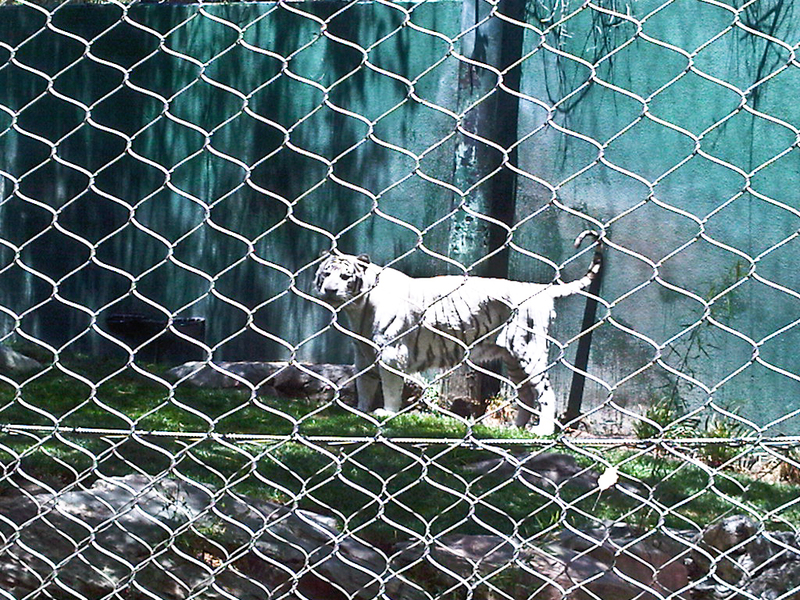 We also visited the white tigers, which are arguably the best attraction in the entire park. 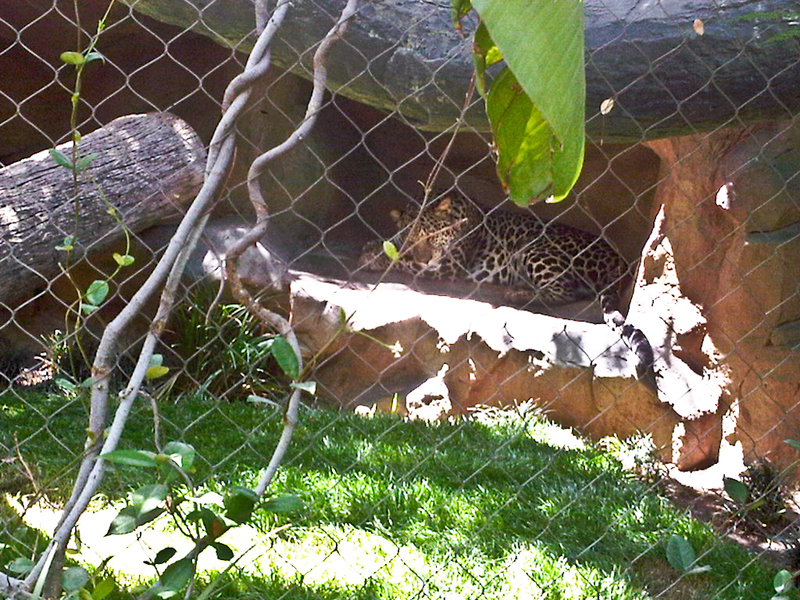 And last, but not least, the park’s lone African leopard. Beautiful cat. Our next stop, or rather, stops, were the casinos at the Mirage, New York New York, the Venetian, Mandalay Bay, Circus Circus, and the Riviera. We didn’t go to Vegas just to gamble, but it was a large part of experience. I didn’t win more than $300, which isn’t bad for someone who really hates throwing away money in pointless games. It was nice joining the Players’ Club at the Mirage, though. Whether I’ll see any of the free rooms I was promised actually get thrown my way. 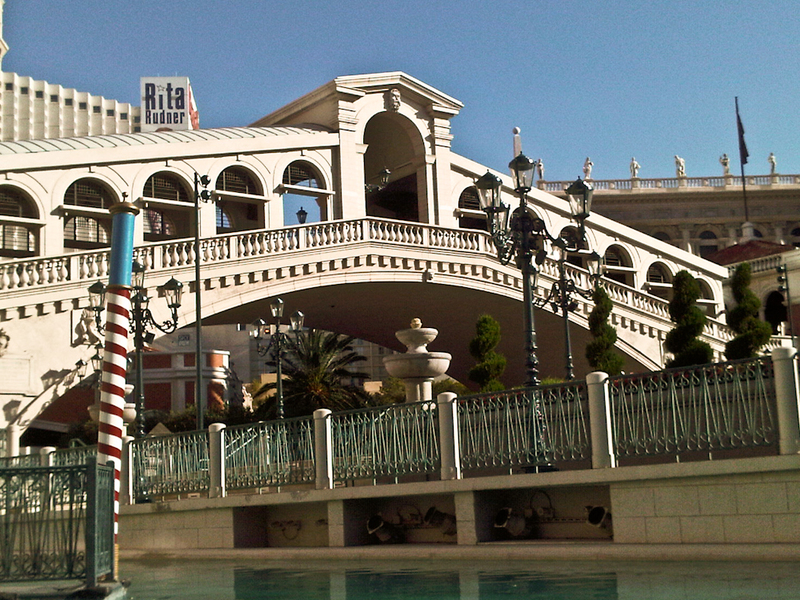 Next up was the gondola ride at the Venetian. Honestly, we would have been better off spending the money somewhere else, as the ride was far too short to justify the nearly $60 we spent for tickets and post-ride photos. Our gondolier was nice, however, and a talented to singer at that. 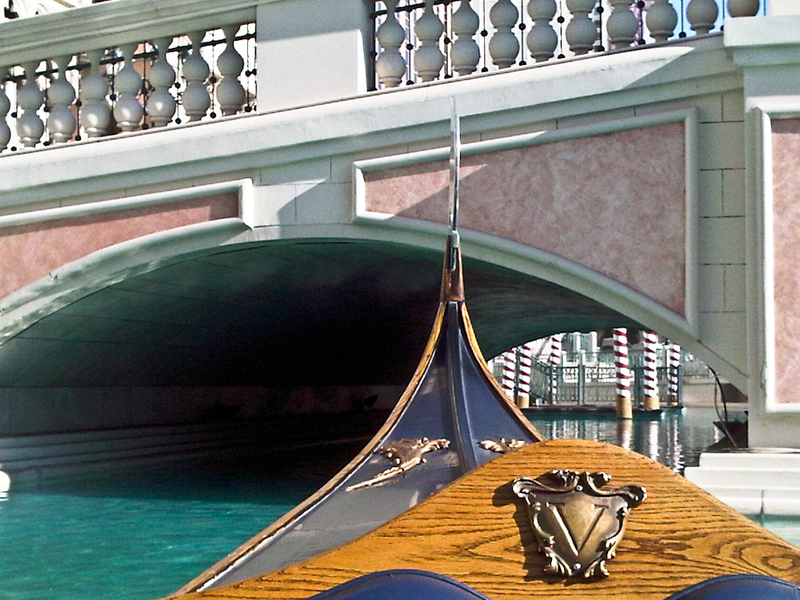 If you ever take the outdoor gondola ride at the Venetian, ask for Alfons. My plan had been to visit the massive Sephora and Madame Tussaud’s at the Venetian as well, but money was running low, so we opted for shopping instead. Maybe next time? 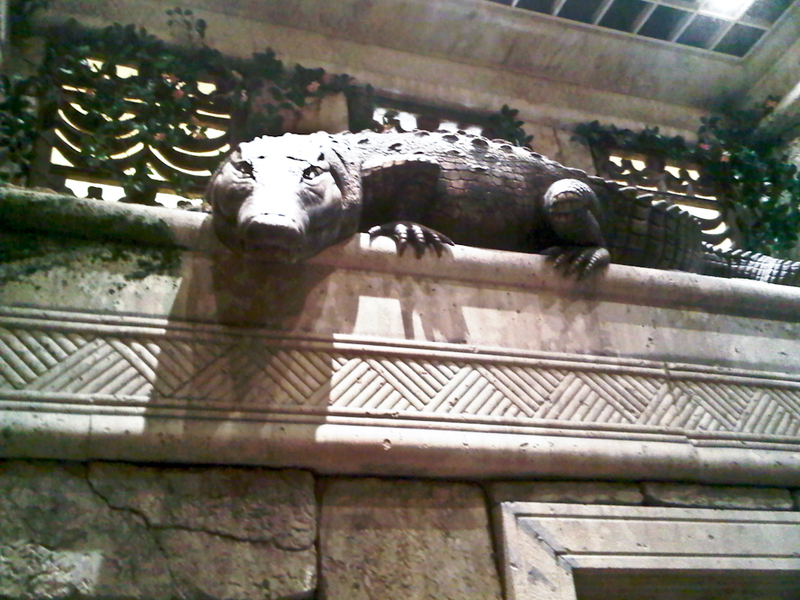 We did see the Indiana Jones and Whoopi Goldberg statues, though my grandmother refused to take photos with them. She’s not a good sport when it comes to taking photos, lol. My grandmother, who hates anything that slithers, was not pleased to meet him. LOL. 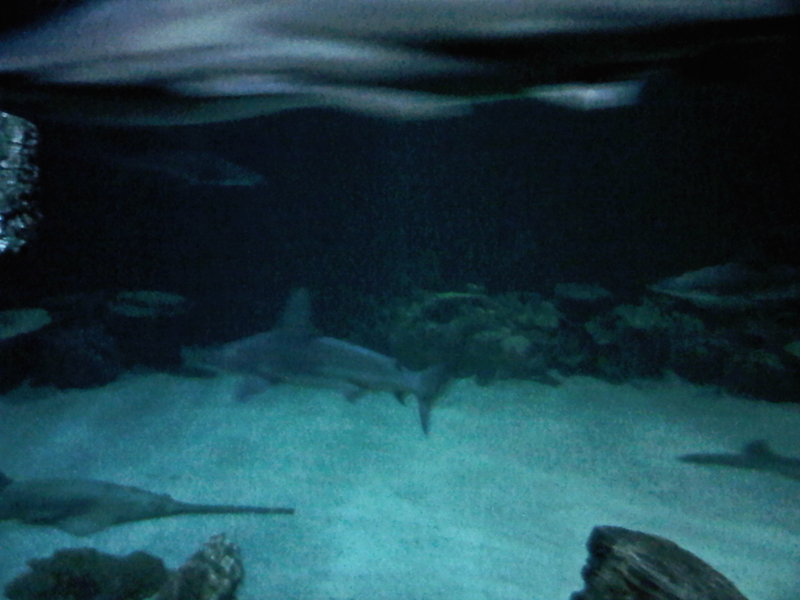 Anyway, the shark exhibit was the best part of the tour, although petting cranky stingrays and horseshoe crabs added its own curious dimension to the tour as well. 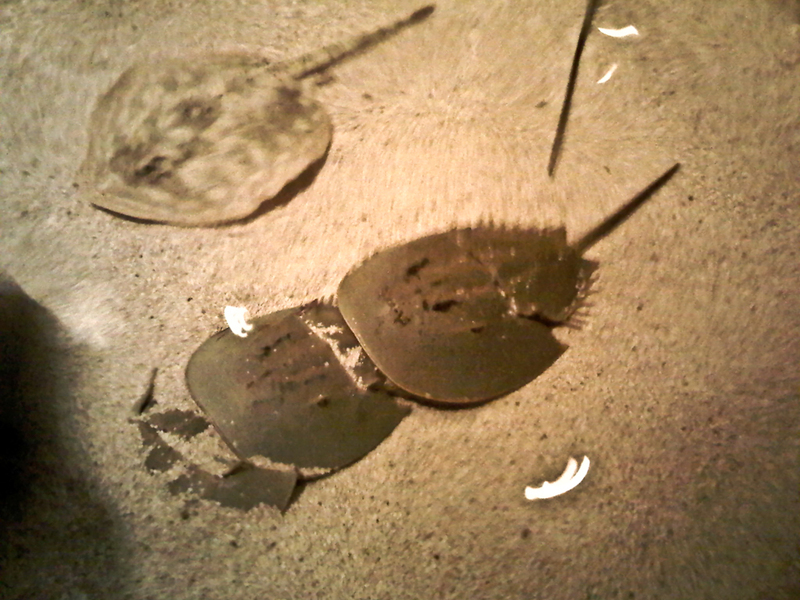 One of the larger stingrays was clearly displeased with the constant petting. It began swimming around the pool angrily, and repeatedly attempted to jump out at visitors. The kids who were tormenting it were lucky to not have gotten stung/stabbed. 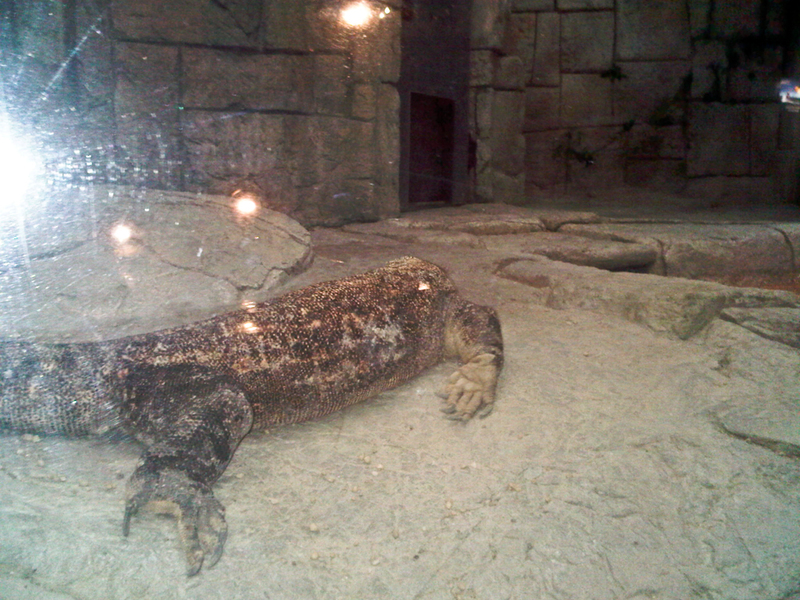 The aquarium is also home to saw fish, komodo dragons, monitor lizards, and sharks. Our last day in Vegas was pretty uneventful. We packed up, and spent about an hour waiting for our airport shuttle to show up. It never did. Fortunately for us, a limo driver who had been sitting in the shuttle bay just as long as we had offered us and a couple from Ohio a discount on a ride to the airport. We got a limo ride for $8 each, plus tip. If you ever find yourself in a similar situation with airport shuttles or cabs, ask a limo driver for a discount! Granted, this driver probably owned the limo and could afford to make that offer, but even so, limos and town cars get the least amount of action at airports, especially now. People can barely afford vacations these days, let alone rides in luxury cars. The driver will be happy to take your offer, as long as it’s reasonable. We got a really good deal from my grandmother’s travel agent, but had she not given us such a good price on our flight and hotel, we would have booked a Expedia.com. Expedia tends to have the best package deals, but shopping around is always best. To sum everything up…it was a good trip. I really enjoyed the Strip, the hotels, and the entertainment, and encourage anyone who hasn’t been to Las Vegas yet to consider taking a trip there!